Want to be able to vote Green Party for President this November? Download and print the petition here. Print as many sheets and you want and gather signatures. Why haven’t you started an online petition? And sent it to every Bernie group in KY? You’ll get your needed signatures in a day! Actually, online petitions are not accepted in Kentucky – in fact in every state where online signatures have been attempted, they have failed to overcome opposition challenges. Yes, but online an online sign-up would create a database for the Green Party to go and simply collect the signatures of people WANTING to sign the petitions. No canvassing required, no time trying to convince people to switch to the Green Party… just people of like mind and thought getting together for a common cause. Time is of the essence here… If no time to create a database, how about advertising local campaign headquarters where people can stop by and sign? I really like your thinking Julie! I’ve already contacted Adam Lynn Kentucky’s Campaign Coordinator and suggested he consider some of the things you’re talking about. As a slightly less inconvenient alternative. Would it be a bon-a-fide signature if I printed the document, signed it on paper, and then scanned the document and sent it to you? This seems to work in many other legal type situations (e.g., contracts). As we understand it, no, all signatures have to be original. Try to remember the entire process is designed to be inconvenient; minor parties are not welcomed in elections. I don’t feel comfortable going door to door but would get together with a few folks to work an event or two here in Lexington. The KGP has to follow Kentucky state law- no matter how unfair to third parties- and do it with the limited resources that we currently have. 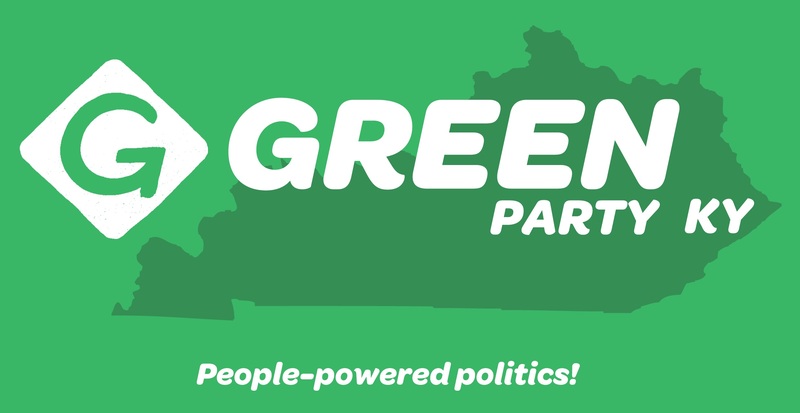 Signers do not have to be registered Green or switch to Green – they just have to be a registered voter in Kentucky. Connect with other Greens that are gathering signatures on Facebook if you want to help. I would like to help collect signatures. Do you know how many signatures are still needed? We only have several hundred right now. 5,000 is the requirement. We’re shooting for 8 or 9,000 just so we can survive a petition challenge. There have been several petitions on line over the course of the Primaries. Getting people out and collecting is just another way to do it! What is the deadline for us to bring our signatures in? I am working on filling as many of these sheets as possible, but I want to make sure I get it in on time. Thanks! I’m a Berner turned Green. September 9th at 4 PM is the deadline, so be sure to send them in at least a few days before that. I’m willing to petition in Henderson. Hi there. Hey, I’m going to be helping the Green Party in Louisville collect signatures. I know you are trying for like 9,000 signatures, but what is the deadline for getting these? Also, doesn’t there have to be a certain distribution of signatures from around the state? Like a minimum from each county? All signatures and petition pages must be on the Secretary of State’s office by 4pm September 9th. There is no geographical dispersion of signatures required, just every petition line needs to be completely filled out. We fully expect a challenge from the Democratic Party so additionally having each line printed clearly and each person signing be a valid and registered KY voter is important as well. We need tables set up at all UK campuses on first day of classes. We’d get those signatures in a couple hours. Btw, I’m also a Berner and ex-Dem looking to the Greens. We need to capitalize on the DNC disaster this week and get a coordinated effort going focusing on urban areas and college campuses. How many more signatures are required as of 8-3-2016? I changed from Dem to Green a month ago. I live in Madison county. Is there a contact person in Richmond or Winchester? Hi Danita, Can I get word also. Plus, as others have pointed out, you have the wrong name for Vice President on the ballot. Is that going to impact the signatures that have already been collected? FYI, we are both Sanders delegates and I was a lead organizer for Metro Detroit for Bernie… We’d love to meet with someone to talk strategy going into November! Do you mean August 14? Hi Elayne, I’ve contacted our Ballot Access Coordinator and asked her to contact you. Why does the petition list someone other than Ajamu Baraka as VP? Hello Roderick! When we first started petitioning, the nat’l campaign provided us the name of Howie Hankins as the likely VP. I’ve discussed this with the secretary of state and our best plan of action is to continue with our current petitions and then submit the VP change AFTER we present the petitions. It’s best to have all petition sheets reflecting the same information. The form states Jill Stein/Howie Hawkins, but isn’t Ajamu Baraka her VP running mate? Does this make a difference? I can print out a form and get some people to sign but want to make sure it’s correct… thank you! We’ve been assured that this won’t be an issue. I’ll try more information to share and post it here. How are the numbers on the petitions? I’m in Laurel Co. An ex-Berner who wants to help break up the duopoly!! When is the deadline for submitting signatures? It’s already done. Jill Stein will be on the ballot in Kentucky!